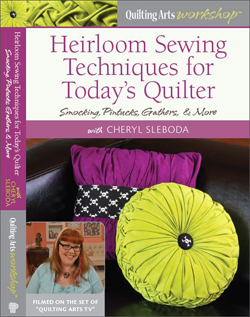 blog – Page 89 – Cheryl Sleboda – Textiles. Technology. Texture. Teacher. Oh boy, so much is going on! Here goes…. Imagine my surprise to see this in the latest issue of Quilting Arts! It also mentions that QATV’s Season 8 will be out sometime in July! Woot!! 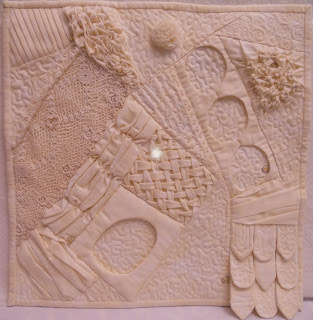 My quilt “Road to Home” was selected to be part of Tactile Architecture 2011! That means I will have a quilt in HOUSTON! 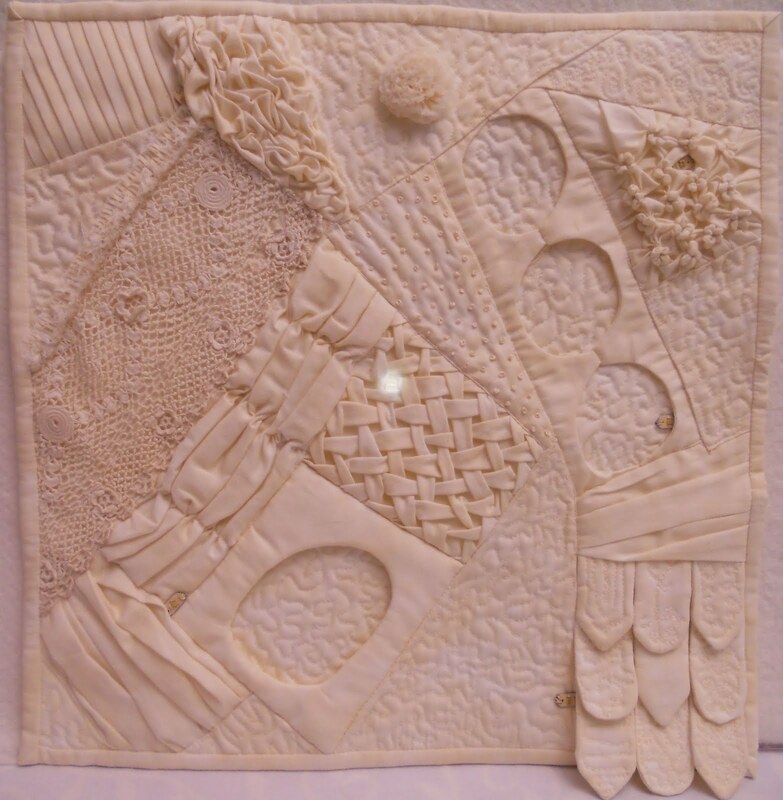 And that self same quilt will travel to all 3 IQA shows next year! I’m thrilled!!! I’m also working on something that I have to keep quiet for now, but you’ll know soon. Sorry for the tease! My DH is editing my latest video for YouTube and we will have it up soon, I hope! 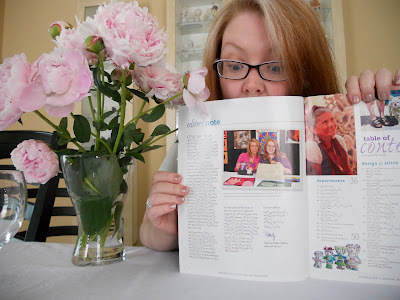 I’m winding up my 2 year term as president of the Riverwalk Quilter’s Guild this month, and I’m handing the reigns over to my good quiltie friend, Catherine Redford! It was a lot of fun. My beautiful “new” peony plants I put in last year came up with a bud or two each this year (these heirloom types take at least 3 years to establish). Check out these gorgeous “bombe” type peonies! My other peony is doing fabulous and the heads weigh so much they touch the ground. I have to remember to stake them next year. The Arduino quilt in the video from this post is my latest e-textile creation. My husband gave me the Lilypad arduino as a Christmas gift, and I had been trying to figure out what to do with it. I was also really stuck on using this fabulous piece of antique lace in an all off-white fabric manipulation piece. The title of this work is called “Shattered” and it was designed for the Naperville Art League’s public art competition, but I didn’t complete it in time. It will go to some other venues and I’m happy that the idea is complete and finally finished. 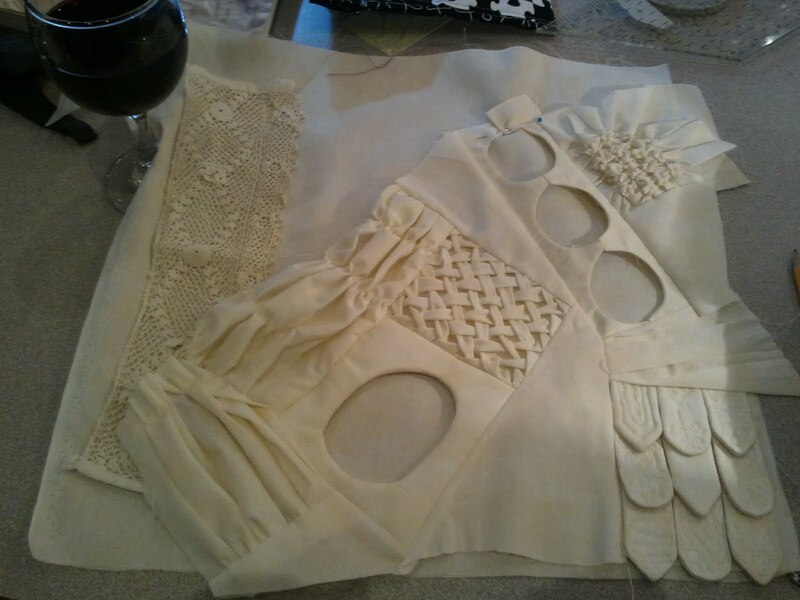 This is what the fabric manipulations looked like in progress. This is a close up of the arduino on the back. It’s held on by the stitches I used with the conductive thread. I mounted this to canvas, because the battery back sticks out pretty far and it will not lay flat against a surface if hung on a wall. I haven’t tested how long it will run on the one battery. The program I wrote was done using a modified version of one of the basic ones it comes with. I must have tweaked it 30 times before I got it right. This uses PWM, or Pulse Width Modulation, which is how you get a LED light to fade. I wanted this to have a soft fade effect for the lights, and the sketch program that I tweaked was better than me writing it from scratch. 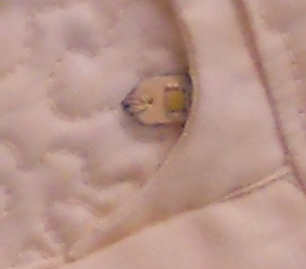 After the lights were put on the front, I painted them with some cream colored acrylic paint so that they more or less disappeared on the surface of the quilt. I hope this answers some of the questions out there about this project. I loved making the quilt itself and really enjoyed figuring out the lights.